Looking for someone to cozy up to this season? Get wrapped up in our warm, full-bodied Cabernet Sauvignon. Flavored with notes of dark fruit, this sophisticated Cabernet Sauvignon is complemented by every lady’s most irresistible indulgence—chocolate. Like all of our options, though, it’s low-cal. So whether you’re hosting a dinner party or just lounging after a long day, our Cabernet Sauvignon will make you feel like you’re indulging. 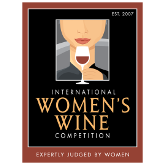 2014 Winner of the San Francisco International Wine Competition Silver Medal and the 2014 Women's Wine Competition Bronze Medal.